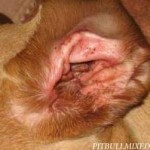 REVOLUTIONARY NEW TREATMENT FOR DOG EAR INFECTIONS! We have been using a new ear infection treatment in dogs (and a couple of cats) in the last 3 months that has made our clients and their pets SOOO Much Happier! It’s a long-acting lanolin-based ointment applied in the clinic ONE TIME, by us right in the exam room. Pet parents don’t have to do anything to the ears at all. (In fact, they are told NOT to flush/ clean the ears as this will decrease the effectiveness of the treatment!) A recheck in 2 weeks determines whether the pet needs continued treatment! The cost of the treatment is about the same as the cost of a bottle of ear drops or ointment. 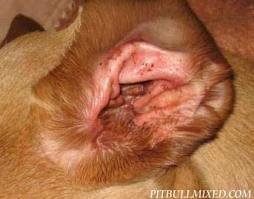 No more fighting with your dog to get medication in their ears 1- 3 times daily! No need to flush at home! Avoid the discomfort of topically treating those painful badly infected ears! While the treatment is not less expensive than standard treatment, every one of our clients has been very happy with the treatment: the same great results with no work on their part! No struggling with their pets at home. No destruction of the loving trust between pets and their people!